We all do it. Even I fall guilty to it at times. It’s really a part of Human Nature…and really what fun is life without it? What exactly are we talking about? Dreaming. We make grand plans and lay them out with the utmost care. We write them out, daydream about them, and (hopefully) we make them come true! There is nothing wrong with doing this…not a single thing! However, as many of you know, rarely do the dreams and plans we lay out stay on course as we would like them to. This holds true many times for mortgage clients. We find that many times, what they initially come to us with when they are being pre-approved, rarely is the same less than 3 years later (There’s a reason 6 out of 10 Canadians break their 5-year term mortgage early). Recently, we had just this happen with one of our clients. A young, working professional couple, found themselves in a difficult situation when one of them was injured and went on long-term disability leave. Their income took a significant drop due to this and their cash flow was of course, negatively impacted. They relied (as many people do) on credit cards and at one point also took out a line of credit. They were able to make minimum payments each month on their loans and debts, but the problem sat with the interest rates. They kept getting higher and the debt they carried wasn’t being reduced. Basically, life had handed them some lemons. At this point, they felt they were left with one option: seek private funding. The problem with this was fear of losing their home if they approached their lender. The interest rate quoted by the private lender was less than that on their credit cards, but still higher than what was reasonable. The couple felt that seeking to obtain a second mortgage would be the best-case scenario. However, with a rate of 10% plus a lender fee of up to 6% of the loan amount and a 1 year term with renewal fee of 1% for total amount borrowed, this was not at all ideal! We consolidated the credit card and line of credit debt at a rate of 2.35% in doing so we reduced their current monthly payments by $1500 with an annual savings of $18,000! Or $90,000 over five years! Letter from insurance company detailing disability payments and confirmation of deposit into current bank account. Mortgage Solution: All debts were paid with proceeds from their 5-year variable-rate mortgage with a 30-year amortization. The annual savings was MORE THAN $18,000! We helped this couple get back on track and allowed them to keep on dreaming! We understand that life rarely will stay on course and go just as you picture it, but there is often a creative solution that can help you get back on track. If life has handed you a few lemons and you aren’t sure where to start, visit a Dominion Lending Centres Mortgage Broker—they can make some of the best lemonade! 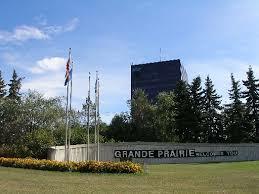 I’m sure you’ve all heard the rumours… Grande Prairie’s property tax rate is one of the highest in Alberta. Recently a very interesting article by Ephraim Vecina has been going around “Property taxes in Canada’s hottest metropolitan markets”. So I thought I would add some local flavour to this article. When qualifying for a mortgage, the cost of carrying the property is included. This means local rates for electricity, heat, condo fee’s and property taxes all affect how much house you qualify for. A smaller property tax is less money you pay each month, and also potentially an extra 10,000 or 20,000 on the amount of mortgage you can buy. Property tax on a 1,000,000 home in Grande Prairie: 1.2864% ($12,864.50) at 1.2% our property taxes are definitely higher than in a lot of large centres. There is hope though. If you choose to live in the County of Grande Prairie: 0.4043% ($4043.6) your tax rates are a 1/3 of what you pay in the city. You can find out the tax mill rate of any municipalty your intertested in living in by calling your local town council, and asking. In a new report, real estate information portal Zoocasa compared the property tax rates of the nation’s hottest metropolitan housing markets, along with the widely varying economic fundamentals that underline these figures. “Home buyers often focus on the home price when considering affordability, but often overlook the carrying costs such as property taxes, which can be a significant on-going expense,” Zoocasa noted as the motivation for the study. Amid widespread concerns about housing costs and interest rates, Canadian home buyers have access to multiple locales of relative affordability – but these places are not necessarily those where property taxes are the lowest, Zoocasa stated.